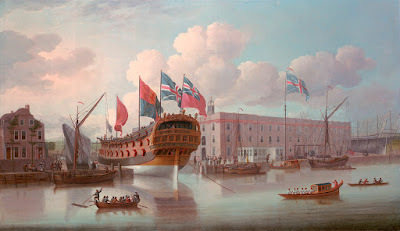 The St Albans Floated out at Deptford, John Cleveley the Elder, 1747, National Maritime Museum. In classic Cleveley style, this painting is populated by numerous figures and shows a ship on the stocks ready to be launched, a particular favorite of John. He has chosen to depict the 50 gun St Albans at the dawn of her career, one that would reach its zenith at the Battle of Lagos in 1759, a decisive British victory and one of the jewels in the crown of the Annus Mirabilis that broke the back of Britain's enemies at sea. Oarsmen in shirtsleeves man a fanciful barge directed by a coxswain in a red jacket. All of them wear red barge caps. These are watermen, and not sailors. 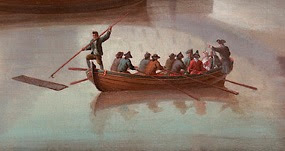 Behind them is a boat with a pair of fellow being rowed about by a pair of oarsmen in red and blue jackets with round hats. At the bow of this boat is a tar pushing away debris from their path. I would be inclined to think this is in anticipation of the imminent launch, but there's a well dressed lady and gentleman in the stern, so it may be that the sailor is pushing it out of the path of the long oars his mates are manning. They wear a mix of brown and blue jackets, round and cocked hats. The mariner on the bow is without a waistcoat and wears brown breeches.